From the Baldwin County Courthouse, go west on Hancock St. which becomes Highway 49 and follow Highway 49 south for approximately 9.7 miles from the Courthouse. Turn left onto County Line Church Rd. Travel approximately one and one half miles. Turn left into the driveway at 254 County Line Church Road. The cemetery is 0.3 mile straight back on this driveway. Where the driveway is no longer driveable, walk the rest of the way -- the drive dead ends at the cemetery. 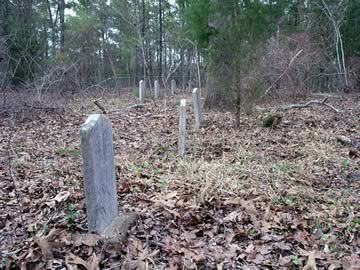 The cemetery is fenced and is quite large, covering an acre or more of property. Aged 66 years. Maiden name per Guy Harrington, Macon, Ga.
Co. H. 4th Ga. Inf. [Pvt on Apr 26,1861.